[Register Here] This epic 100.2 mile journey has an impressive ten thousand ft of gain with two longer climbs and numerous "shorter" ones! But fear not, you’ll enjoy miles of redwood forested climbs and descents, vast ridge top vistas, cool creek-side canyons and bucolic coastal agricultural lands. 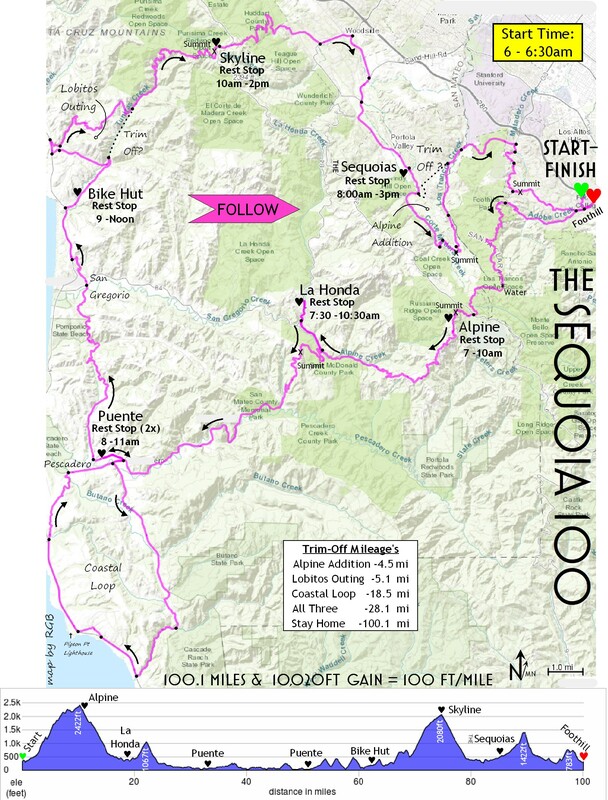 This route provides what many are calling “cycling perfection” with an amazing 7 well staffed and generously supported Rest Stops and the quiet coastal towns of La Honda, San Gregorio and Pescadero. You'll take on the stunning early am climb on Page Mill Rd, the W. Alpine descent, miles of redwoods, a scenic tour on Hwy One north past Pigeon Pt. Lighthouse, all of Stage Rd, the mid day ascent of Tunitas Creek and the infamous pm climb on upper Alpine and Joaquin... "just for fun!" There are at least three “bail-out” options to test your tenacity and resolve, and we’ll have our “Fun Finish” with ice-cold chocolate milk, vendors, music and a hearty meal at our shaded site at Foothill College to complete your amazing day!